Comparing similar products from different companies can be tough – everyone has their favorites and you’ve probably known what you like for years. There’s no rational reason that I like Bugs Bunny more than Mickey Mouse, I just do – and I have similar preferences for everything from who makes my computer to what brand of ketchup I buy. I’m sure you have similar preferences, but sometimes it’s helpful to put those aside and look at things with cold logic. Which is what we’re going to do right now: it’s the 2019 Chevy Silverado vs 2019 Toyota Tundra! First a few ground rules, we’re going to keep things fair by only comparing similar builds and trim levels. Don’t worry; you’re not going to see me pit the best engine available for the Silverado against the starting engine in the Tundra. But we’ll try to look at different options across the board and compare them against each other, so you can see what Chevy and Toyota each offer, and make up your mind on which is superior. We’re not going to look at every tiny detail of both of these vehicles, because who has that kind of time? But we’ll hit the major points and see where they each stack up – perhaps I’ll even declare a winner, crowned champion of all non-heavy-duty full-size trucks in perpetuity; its reign shall last a thousand years and herald a new, glorious dawn for all human civilization. Probably not, but at least we’ll see what each of these trucks offers and then take it from there. Let’s get things started by looking under the hood and seeing what kind of power each of these trucks has to offer. There are two different things I want to see here: what do they start with, and how impressive can each one get. The starting engine is good because it shows us what the manufacturer thinks of as a baseline, but I also want to know what they see as the ultimate level of power that can be packed into these pickups. The standard engine for the 2019 Chevy Silverado is a 4.3L EcoTec3 V6 engine that offers up to 285hp and 305 lb.-ft. of torque. I’ve got to say, that’s pretty good, and seems like plenty of power for a wide range of full-size truck owners. By comparison, the 2019 Toyota Tundra starts off with a 4.6L Aluminum i-FORCE V8 engine that offers up to 310hp and 327 lb.-ft. of torque. Just looking at the numbers, it’s pretty clear that Toyota has won the first round – that’s some excellent power to start off with. Now let’s see what you can do if money is no object and you want the most power you can possibly pack into these trucks. The 2019 Chevy Silverado has an available 6.2L EcoTec3 V8 engine that offers up to 420hp and 460 lb.-ft. of torque. That’s a huge boost from the starting engine, but let’s see what Toyota answers with. There is an available 5.7L Aluminum i-FORCE V8 engine for the Toyota Tundra that provides up to 381hp and 410 lb.-ft. of torque. There’s a pretty clear winner here: the high-end engine in the Silverado solidly beats out what you can get in the Tundra. Comparing horsepower and torque is great and all, but I’m interested in what that actually means for these trucks in terms of functionality. In particular, I want to know what kind of towing capacity and payload limit these two trucks have. To keep things simple, let’s just look at maximum numbers, which means these aren’t necessarily standard amounts for these trucks. 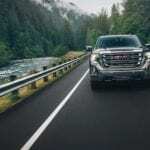 But if you want to tow a lot of weight, you’re probably already interested in what these trucks can do with any optional towing packages available. With the right packages chosen and proper setup, the 2019 Chevy Silverado can haul up to 12,200 lbs. and has a maximum payload of up to 2,250 lbs. By comparison, the 2019 Toyota Tundra has a maximum towing capacity of 10,200 lbs. and a payload limit of 1,660 lbs. Just by comparing straightforward numbers, we can see that when it comes to hauling any kind of load, the Silverado is a clear winner. Now that we know what kind of muscle each of these trucks can provide, let’s have a look at the options you can choose from for the interior of these beauties. Rather than spend time on every possible trim level or choice, let’s just look at some of the available options that you can have, particularly those at the highest trim or model level. So keep in mind these are not standard features, but the best of what each has to offer. The 2019 Chevy Silverado has an available 8-inch touchscreen display with Navigation and supports streaming from two devices. There is a wireless charging pad available, as well as a 7-speaker Bose premium sound system and USB ports both for charging and streaming media to the sound system. There are available leather-appointed heated seats, dual-zone climate control, and an 8-inch Driver information screen that provides additional details directly to the driver about the vehicle’s status. On the other hand, the 2019 Toyota Tundra has an available 7-inch touchscreen display with Navigation and hands-free functionality. There is a premium JBL sound system available, which includes numerous USB ports for streaming media or charging devices. Available dual-zone climate control keeps everyone in the cab comfortable, while heated front seats are ideal in winter. There is also a 4-inch Driver information screen in the Tundra, to keep the driver updated on everything going on with the vehicle. Whenever I compare any two vehicles, I always look at the safety features they offer. Not just what you get standard, but also what kinds of upgrades and additional features are available at higher trim levels or with the right choice of model. And so, let’s see what Chevy and Toyota have on offer to keep us safe. The 2019 Chevy Silverado has a number of safety features including airbags, available front and rear parking assist, an available HD rear vision camera, and hitch guidance to help when towing a trailer or camper. You can also get a rear cross traffic alert, a lane change alert with side blind zone alert, and other options in the Silverado. Plus Chevy has a Teen Driver safety feature that helps with teaching new drivers good habits. By comparison, the 2019 Toyota Tundra has numerous airbags, a pre-collision system that includes pedestrian detection, and both stability and traction control. There is a lane departure warning with automatic sway warning to help you stay in your lane, along with front and rear parking assist. There’s a blind-spot monitor on the Tundra, but it lacks anything like the Teen Driver feature of the Silverado, and there isn’t an available HD option for the rear camera. So, when all is said and done, which truck is better? Well, there’s a lot going for both trucks, and I’m not going to tell you which one to get, but I will point out a couple things. The 2019 Chevy Silverado has a more powerful engine available than the 2019 Toyota Tundra, but the Tundra’s starting engine is more powerful than the Silverado’s, while the Silverado has greater maximum towing and payload values. Interior and safety features on both of these trucks are pretty comparable, though Chevy does offer a few things you won’t find on the Tundra. Toyota-lovers, you’re probably not about to change your mind, but to everyone else, I would definitely recommend giving the Silverado a good look as it may just be the leader in the head to head competition. Previous post: Which Used SUV Should You Buy From Your Local Used Car Dealer?